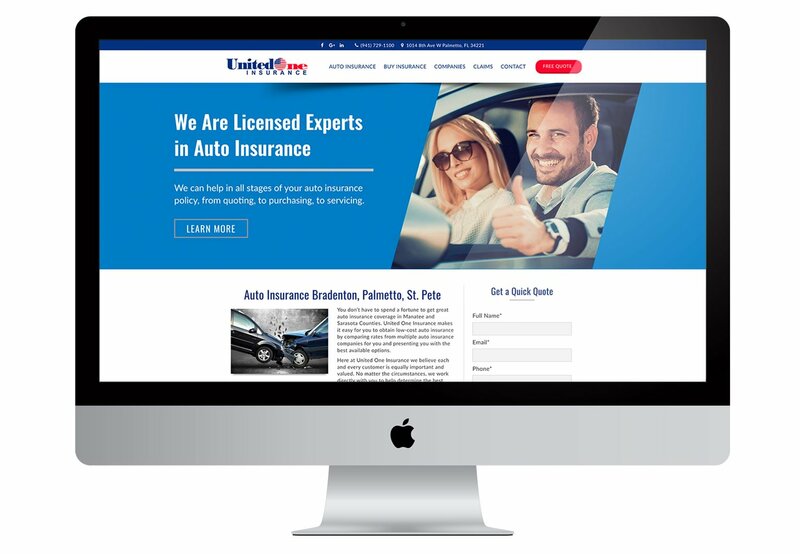 United One Insurance is a local auto insurance company servicing Manatee and Sarasota Counties. For their website, it was important that submitting a quote was always a click away and the quote button was visible wherever the visitor went. We did this by using our ‘sticky header,’ which is always located on top of the page. The phone number is also stationary. On the home page, we have a quote contact form shown right away. United One’s logo has the flag in a circle so to reflect this, we used circular images throughout the site. As part of our ‘Advanced SEO’ services, we created pages for auto insurance, motorcycle, commercial, and various DUI insurances. Since these are extremely competitive to rank for, we included city keywords to improve visibility in local markets.